The building is circular in shape and it’s simplicity in design is partly what makes it so attractive to look at. It’s when you go inside, that you can really see what at a masterpiece it is. The best way to experience the Royal Albert Hall is to book a ticket for a show. These are usually quite expensive and depending on the show, hard to come by. Another option for seeing inside is to take one of the regular guided tours. We enjoyed our tour and thought it gave a fascinating insight into the building and its history. However, you need to bear in mind that it is not a “behind the scenes” tour and instead it mainly focuses on the public areas of the hall that you would see anyway if you had a ticket for a show. The one exception is that you do get to stand in the private Royal reception room! The Royal Albert Hall does occasionally offer a “backstage” tour which does go behind-the-scenes but these are rare. 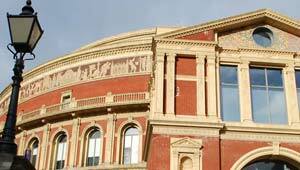 The Royal Albert Hall tour runs every day except Wednesdays from 10.30am to 3.30pm. Sometimes tours are cancelled because of matinees, so check with the hall which tours are running when you want to go and it’s advisable to book advance. Adult tours are £11 (2012 prices) but the tour is free with the London Pass. Getting to the Royal Albert Hall by tube involves a 15 minute walk. The nearest stop is South Kensington and then follow the signs on foot.